Anyone who has ever tried to start a fire when everything in the woods is soaking wet knows the value of a good fire starter. An experienced woodsman can usually locate a pitch pine stump to get a fire started with, but it sure is a lot easier to reach in your pocket and pull out a ready-made emergency fire starter. I have experimented with several different fire starters over the years and have settled on four that I consider the best. 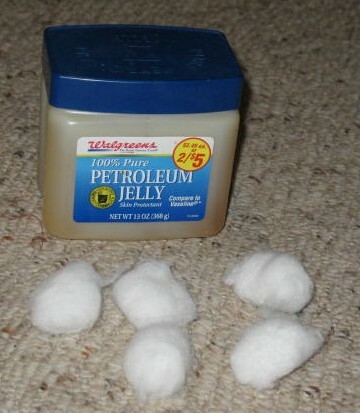 A super simple way to make a fire starter is to take a regular cotton ball and rub petroleum jelly (Vaseline) into it. The cotton ball acts as a wick, and the petroleum jelly is what actually burns, so keep rubbing and pressing until you get the absolute maximum amount of jelly worked into the cotton. I’ve nick-named these jelly balls, and they really work. I timed one of these little beauties to see just how long it would burn. It burned with a flame for 6 1/2 minutes, and then the cotton continued to burn without a flame for several additional minutes. Six and a half minutes of flame could give you a good edge when it comes to igniting some damp tinder, like shredded cedar bark or very small sticks. I keep six of these jelly balls in a plastic 35mm film can, and drop the can in my pocket every time I head out into the woods. scissors to cut out these four circles. paraffin until it is the consistency of very thick oatmeal. 7. Set the filled tubes aside and let them harden for a few minutes. tube several times to build up a good layer of wax on the outside. Your fire starters are now ready to use. 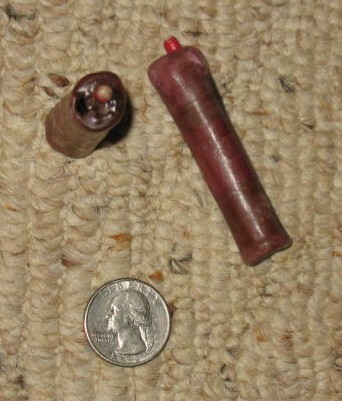 To light one all you need to do is peal back part of the outer cardboard tube and set match or lighter to it. I carry three of these in my backpack when camping, and I keep a couple in the glove box of my truck. You can make a quick and easy fire starter out of corrugated cardboard, cotton string, and paraffin. Cut strips of corrugated cardboard about 1 1/2″ wide by 9″ long. Roll the cardboard up into a fairly tight cylinder and tie cotton string around it to hold it in place. 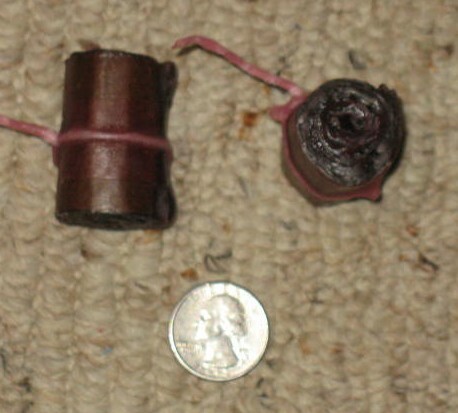 Hold the end of the string and dip the cardboard cylinder into melted paraffin. Hang the cylinder up to dry for a minute, then dip again. Repeat this process until the cardboard is well coated with wax. I usually leave about an inch of paraffin covered string attached to the fire starter as a wick. The last fire starter that I want to tell you about is a variation of the corrugated cardboard/paraffin fire starter. This is my own little invention that I call the self-lighting fire starter. To make this fire starter, begin by cutting several squares of corrugated cardboard that are 2 1/4″ by 2 1/4″. Roll each square into a fairly tight cylinder and tie with string, as above. Take one cylinder and dip it into melted paraffin. Hold it in the paraffin for several second so that it is thoroughly soaked. Now lift it out of the paraffin; and, while the paraffin is still soft, push a strike-anywhere kitchen match down into the center of the cylinder. Leave just the head of the match exposed above the top of the cylinder. Now dip the cylinder along with the match head end back into the melted paraffin. Remove quickly. You don’t want a heavy coat of paraffin over the match head; just enough to waterproof it. 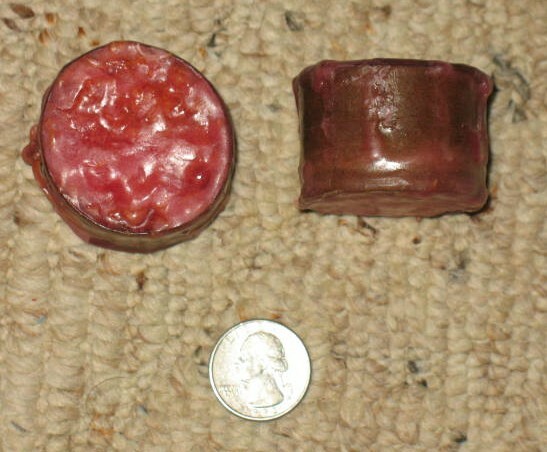 Dip several more times to coat the cylinder thoroughly, but try not to get too much more wax on the match head. Make several of these and store them in an old metal band-aid box. To use these fire starters, just take one out of the box and strike it like a giant match. One SAFETY WARNING: Don’t store these fire starters loose in a pack, your clothing, a glove box, or etc. You don’t want one of these to rub against something and accidentally ignite. Well, there you have it. Four simple to make and highly effective fire starters. There’s no excuse not to get that fire started now, so go out and enjoy your time in the woods. For a fire starter that I find better than just a petroleum jelly cotton ball (PJCB) I make a variation on that theme. I melt petroleum jelly and paraffin or wax in a double boiler and then pour it into a zip top bag with cotton balls in it. Since cotton is pretty absorbent it will soak up the hot liquid pretty well. After pouring the melted mixture into the gallon zip top bag with the cotton balls, I squeeze out the air so that the liquid will penetrate into the center of the cotton balls. Then I release the pressure and keep the mixture and balls moving as the mixture begins to cool and stiffen up so as to prevent pooling of the liquid. Once completed and cool you can use all or part of each ball as a fire starter. Under prime conditions you could probably get up to 10 fires started with each ball by pulling a small piece off and using it. Regardless of whether you use a whole ball or only a portion of one, you will want to pull small bit of the ball off to pull out the fine fibers of the cotton. These fine fibers will take a spark from even a depleted BIC lighter and burn happily. A whole one of these starters will normally burn for 5 minutes or more. Cost, using products from WalMart, is roughly 4-5 cents per starter. They are virtually waterproof. The wax makes them stiffer and less slimy than straight petroleum jelly and the petroleum jelly makes them softer than a candle which is what you get when you dip cotton balls into melted wax.